Sodium lactate seemed to improve fluid balance and avoid fluid overload. The objective of this study was to determine if these beneficial effects can be at least partly explained by an improvement in disseminated intravascular coagulation (DIC)-associated renal microvascular thrombosis. Ancillary work of an interventional randomized open label controlled experimental study. Fifteen female “Large White” pigs (2 months old) were challenged with intravenous infusion of E. coli endotoxin. Three groups of five animals were randomly assigned to receive different fluids: a treatment group received sodium lactate 11.2% (SL group); an isotonic control group received 0.9% NaCl (NC group); a hypertonic control group, with the same amount of osmoles and sodium than SL group, received sodium bicarbonate 8.4% (SB group). Glomerular filtration rate (GFR) markers, coagulation and inflammation parameters were measured over a 5-h period. Immediately after euthanasia, kidneys were withdrawn for histological study. Statistical analysis was performed with nonparametric tests and the Dunn correction for multiple comparisons. A p < 0.05 was considered significant. 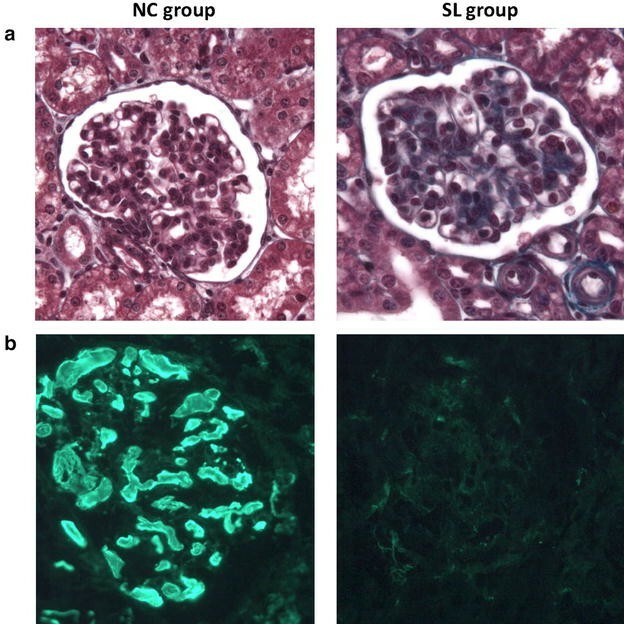 The direct immunofluorescence study revealed that the percentage of capillary sections thrombosed in glomerulus were significantly lesser in SL group [5 (0–28) %] compared to NC [64 (43–79) %, p = 0.01] and SB [64 (43–79), p = 0.03] groups. Alterations in platelet count and fibrinogen level occurred earlier and were significantly more pronounced in both control groups compared to SL group (p < 0.05 at 210 and 300 min). The increase in thrombin–antithrombin complexes was significantly higher in NC [754 (367–945) μg/mL; p = 0.03] and SB [463 (249–592) μg/mL; p = 0.03] groups than in SL group [176 (37–265) μg/mL]. At the end of the experiment, creatinine clearance was significantly higher in SL group [55.46 (30.07–67.85) mL/min] compared to NC group [1.52 (0.17–27.67) mL/min, p = 0.03]. In this study, we report that sodium lactate improves DIC-associated renal microvascular thrombosis and preserves GFR. These findings could at least partly explain the better fluid balance observed with sodium lactate infusion. Sepsis, considered today as a syndrome of physiologic, pathologic and biochemical abnormalities induced by infection , is a major public health concern responsible for considerable morbidity and mortality . Sepsis is frequently complicated by acute kidney injury, which is associated with higher risk of in-hospital mortality [3, 4], and by disseminated intravascular coagulation (DIC) due to a massive activation of the coagulation system [5, 6]. Many studies imply that DIC is an important mediator in both microvascular thrombosis, multiple organ failure syndrome development  and mortality in patients with serious infections . Sepsis is also associated with deficit in effective blood volume. Large amounts of intravenous fluids are commonly used to increase cardiac output and improve peripheral blood flow . First, mounting evidence suggests that resuscitation fluids contribute, in varying degrees, to clinically relevant renal [10, 11] and haemostatic disturbances, particularly if artificial colloids such as hydroxyethyl starch (HES) and gelatine or saline preparations are used. The undesirable consequences of using HES resulted in a strong recommendation  against the use of HES in resuscitation of patients with sepsis [12, 13]. Moreover, saline with the presence of supraphysiological concentrations of chloride may increase the incidence of acute kidney injury and the use of renal replacement therapy [14–16]. Secondly, aggressive use of large-volume intravenous fluids induces fluid overload which is associated with renal failure [17, 18] and leads to hemodilution, which in turn may exacerbate coagulopathy . In order to reduce the volume of intravenous solutions, the concept of small volume resuscitation with hypertonic saline and/or hypertonic saline–HES or dextran has been widely studied during trauma resuscitation [20, 21]. The potential of these hypertonic fluids to modulate the coagulation cascade is less well known, as data are limited and contradictory . Anyway, hypertonic solutions containing HES and/or saline could increase acute kidney injury in sepsis as far as isotonic fluids. Hence, in an attempt to avoid the detrimental effects of chloride anion and/or HES, the use of metabolized anions such as lactate could be more suitable. The use of lactate, as a resuscitation fluid-based energetic substrate, is an interesting alternative because this anion is well metabolized  even in poor hemodynamic conditions . We previously observed that sodium lactate infusion enhanced fluid balance in pig endotoxic shock [25, 26]. This beneficial effect of sodium lactate could not be totally explained neither by its hyperosmolar or alkalizing effects  nor by its energy load or its effect on the chloride balance . Finally, two additional mechanisms have been hypothesized: first, lactate infusion is better metabolized in poor hemodynamic conditions than glucose, and second, lactate could decrease proinflammatory response and/or improve endothelial barrier function. Interestingly, it is well known that proinflammatory response and endothelial dysfunction exacerbate the endotoxin-induced DIC [27, 28]. So, in order to better understand the beneficial effect of sodium lactate on fluid balance, we conducted an ancillary work focused on DIC and renal histology. The main objective of the present study was to determine if sodium lactate improve DIC-associated renal microvascular thrombosis. The secondary objective was to explore the glomerular filtration rate (GFR). This is an ancillary work of a recent experimental study on the beneficial hemodynamic and metabolic effects of sodium lactate infusion in endotoxic shock . The experimental protocol (CEEA No. 132012) received the approval of the Nord-Pas-de-Calais Animal Ethics Committee (Comité d’Ethique en Expérimentation Animale Nord-Pas-de-Calais; C2EA-75) and the French Ministry of Education and Research. Care and handling of the animals were in accordance with the experimental animal use guidelines of the French Ministry of Agriculture and Food. For the experiment, animals were premedicated with intramuscular injection of ketamine (Kétalar®, Virbac, France, 2.5 mg/kg of body weight) and xylazine (Sédaxylan®, CEVA Santé Animale, France, 2.5 mg/kg of body weight). Then, we used isoflurane (AErrane®, Baxter, France) for the intubation process, and maintenance of anaesthesia was performed with a continuous infusion of midazolam (Hypnovel®, Roche, France, 1 mg/kg body weight/h) for the whole experiment. All animals were mechanically ventilated (Osiris 2®, Taema, France) with a tidal volume of 8 mL/kg, a positive end-expiratory pressure set at 4 cm H2O to limit cardiovascular effects, FiO2 0.6 to prevent fatal hypoxaemia during the study, and respiratory rate 20–24 breaths/min only adjusted to maintain normocapnia (40–45 mmHg) at baseline. We chose to maintain ventilation similar in all animals during the experiment. No recruitment manoeuvres were done. Muscle relaxation was obtained by a continuous intravenous infusion of cisatracurium besylate (Nimbex®, Hospira, France, 2 mg/kg body weight/h). Analgesia was achieved by a subcutaneous injection of buprenorphine (Vetergesic®, Sogeval, France, 0.1 mg/kg body weight). After dissection of neck vessels, catheters were inserted in the right carotid artery for continuous blood pressure monitoring and blood sampling. To monitor urine output, a suprapubic urinary catheter was inserted. Fifteen female “Large White” pigs (2 months old) were used in this study. The study was carried out as depicted in Fig. 1. During preparation period, animals received 25 mL/kg 0.9% NaCl to prevent hypovolemia. Measurements were taken over a 5-h period: at baseline after the stabilization period (T0) and at 60 (T60), 120 (T120), 210 (T210) and 300 (T300) minutes. All animals were administered 5 μg/kg/min Escherichia coli lipopolysaccharide (LPS) (serotype 055:B5; Sigma Chemical Co., St. Louis, MO, USA). The endotoxin was diluted in 50 ml of 0.9% NaCl and infused over a 30-min period intravenously. We studied three groups receiving 450 mL (from T30 to T300) of different fluids as follows: a treatment group (n = 5) receiving 11.2% hypertonic sodium lactate AP-HP® (AGEPS, Paris, France) (SL group) containing 90 g (1000 mmol) of lactate and 23 g (1000 mmol) of sodium per litre and two control groups; one isotonic control group (n = 5) receiving 0.9% NaCl (NC group), and one hypertonic control group (n = 5) receiving 8.4% hypertonic sodium bicarbonate (SB group) containing 61 g (1000 mmol) of bicarbonate and 23 g (1000 mmol) of sodium per litre. Sodium bicarbonate provided the same amount of sodium (450 mmol) and osmoles (900 mosm), and the same alkalizing effect than sodium lactate . The SL group received 40.5 g lactate (3.61 kcal/g). NC and SB groups received an equivalent energy supply: 39 g glucose (3.75 kcal/g) as 780 mL 5% glucose solution (Baxter SAS, Guyancourt, France) from T30 to T300. Finally, the SL group received 780 mL sterile water for injection (Baxter SAS, Guyancourt, France) in place of the 5% glucose solution to ensure the same fluid intake in the three groups. The only resuscitation endpoint was mean arterial pressure (MAP). If MAP felt below 65 mmHg, 2.5 mL/kg infusion of NaCl 0.9% was given as rescue therapy every 15 min. Bolus infusions were performed to maintain MAP above 65 mmHg as recommended by Sepsis Surviving Campaign . At the end of the study period, all animals were sacrificed with T61 administration (T61, 0.3 mL/kg of body weight, Intervet International GmbH, Köln, Germany). At the end of the experiment and immediately after euthanasia, kidneys were withdrawn for histological study. After macroscopic examination, a part of the samples from each kidney were fixed with acidified formal alcohol (AFA) and another part of the sample was frozen by liquid nitrogen and stored at − 80 °C. The samples fixed in AFA were embedded in paraffin and sectioned (3–4 μm width). After deparaffinization and rehydration, sections were stained with Masson’s trichrome, Periodic acid–Schiff (PAS) and hematoxylin eosin safran (HES) and evaluated in light microscopy. On frozen tissue, cryosections of 5 μm were cut on a cryostat and incubated 30 min with an antifibrinogen antibody directly conjugated with fluorescein for a direct immunofluorescence. The antibody was a polyclonal rabbit antibody, which recognized fibrinogen (ref. F0111, Dako SA, Trappes, France). We established two semiquantitative scores for histological abnormalities defined as: score (%) = (number of glomeruli damaged)/(number of glomeruli examined) and (number of capillary sections thrombosed)/(number of capillary sections examined) per damaged glomeruli. At least 50 glomeruli were observed in each sample. The pathologist was blinded to the groups examined. Leucocyte, haemoglobin and platelet counts were obtained on EDTA anticoagulated blood. For coagulation assays, blood (four parts) was collected in tubes containing 3.8% sodium citrate (one part). Fibrinogen levels were rapidly measured by standard procedures. Immunoassay methods were used to determine quantitative thrombin–antithrombin complexes (TAT) (Enzygnost® TAT micro, Siemens, Munich, Germany). Fibrin monomer (Liatest FM® Stago, Asnières, France) was performed by immunoturbidimetric assay. The quantitative determination of vWF antigen (Ag) was measured by turbidimetric assay (vWF Ag® Reagent, Siemens, Nederland) (n = 70–100%). TNFα and interleukin-6 (Il-6) were measured in serum. Plasma levels were detected by ELISA method with porcine anti-TNFα antibodies (Quantikine® Porcine TNFα, R&D Systems, USA) and anti-Il-6 antibodies (Quantikine® Porcine Il-6, R&D Systems, USA). Blood and urinary creatinine levels (Cobas® 8000 modular analyser, Roche Diagnostics, Switzerland) were measured at each time except T30. We computed creatinine clearance, a surrogate marker of GFR, with standard formula [creatinine clearance (CrCl) = (creatinine urinary concentration × rate of urine formation)/Creatinine plasma concentration]. Diuresis, a marker of both GFR and tubular function, was measured at each time except T30. We considered that the sample size of five animals per group would be sufficient to show a statistical difference if any based on a previous work on the same model . Statistical analysis was performed with GraphPad Prism 6 software (San Diego, California). As the distribution was not normal (Shapiro–Wilk test), quantitative data were expressed using median and interquartile range. Considering the differences between groups for some parameters at baseline, values are expressed as a percentage of the first value. For multiple intergroup testing, we used Kruskal–Wallis test with Dunn’s multiple comparisons test and Mann–Whitney U test. Intragroup comparisons were realized by Friedman test with Dunn’s multiple comparisons test and Wilcoxon matched-pairs signed rank test. The two-tailed significance level was set at p < 0.05. Median weight was similar in the three groups of animals: 22.5 (18.25–23.75) kg in NC group, 23 (21.75–23.5) kg in SB group and 23 (20.5–24) kg in SL group. The endotoxin challenge resulted in hypodynamic shock with a decreased of cardiac index in all animals. As already described, the infusion of sodium lactate infusion enhanced hemodynamics with a limitation of fluid overload . Kidneys appeared macroscopically enlarged and swollen in the three groups. Glomeruli showed signs of oedema uniformly, and fibrin thrombi were mainly observed in glomerular capillaries (Fig. 2). Percentage of thrombosed glomeruli and percentage of thrombosed capillary in glomerulus were significantly higher in control groups compared to SL group (Table 1) and consistent with an increased amount of microthrombosis. Percentage of thrombosed glomeruli (%) = (number of glomeruli damaged)/(number of glomeruli examined) and percentage of capillary sections thrombosed (%) = (number of capillary sections thrombosed)/(number of capillary sections examined) per damaged glomeruli. Results are expressed as median with interquartile ranges. Kruskal–Wallis test with Dunn’s multiple comparisons test and Mann–Whitney U test were used for intergroup comparisons. Changes in leucocyte, platelet count, fibrinogen, haemoglobin, TAT and vWF in the three groups are illustrated in Fig. 3. As expected, we observed a dramatic procoagulant response. Alterations in platelet count and fibrinogen level occurred earlier and were significantly more pronounced in both control groups compared to SL group. Circulating platelets significantly declined at T300 in NC [28 (24–45) %; p = 0.03 compared to baseline] and SB [38 (24–50) %; p = 0.03 compared to baseline] groups, while in SL group, the decrease in the platelet count was less important [67 (48–74) %; p = 0.06 compared to baseline]. In the same way, the activation of the coagulation cascade was illustrated by a decrease in circulating fibrinogen. Fibrinogen level significantly declined at T300 in NC [45 (39–63) %; p = 0.03 compared to baseline] and SB [53 (26–69) %; p = 0.03 compared to baseline] groups, while it remained stable in SL group [85 (73–92) %; p = 0.06 compared to baseline]. The increase in fibrin monomer started earlier and was significantly higher at T120 in NC [104 (82–175) μg/mL; p = 0.01] and SB groups [161 (69–200) μg/mL; p = 0.03] compared to SL group [28 (19–74) μg/mL]. Unfortunately, we could not interpret the results at 210 and 300 min in the three groups because some values were over 200 μg/mL, the upper limit of measurement, despite dilutions (data not shown). Thrombin–antithrombin complex (TAT) concentrations started to increase at T60 to achieve a maximum level at T210. The increase in TAT complexes was earlier and significantly higher in NC [754 (367–945) μg/mL; p = 0.03] and SB [463 (249–592) μg/mL; p = 0.03] groups than in SL group [176 (37–265) μg/mL]. Von Willebrand factor (vWF) increased in all animals without any significant difference between groups. Changes in interleukin-6 and TNFα in the three groups are illustrated in Fig. 4. We observed a same evolution of TNFα levels in the three groups without any significant differences. TNFα increased rapidly, peaked at T120 in both hypertonic groups and at T210 in NC group, and subsequently decreased until the end of the experiment without returning to baseline levels. Il-6 was significantly higher in NC group [22,938 (16,619–29,613) pg/mL at T210 and 25,687 (18,617–42,792) pg/mL at T300] compared to SL group [7904 (4838–9310) pg/mL at T210, p = 0.02 and 6148 (4216–13,445) at T300, p = 0.03] and SB group [9234 (8108–10,869) pg/mL at T210, p = 0.02 and 8433 (5174–11,961) at T300, p = 0.02]. No significant differences were seen on Il-6 evolution between SB and SL groups at any time. Creatinine clearance (CrCl) and diuresis in the three groups are illustrated in Fig. 5. At the end of the experiment (between T210 and T300), diuresis was significantly higher in SL group [150 (125–245) mL] compared to NC [5 (2.5–82.5) mL, p = 0.03] and SB groups [35 (1–110), p = 0.02]. Creatinine clearance was higher in SL group [55.46 (30.07–67.85) mL/min] compared to NC [1.52 (0.17–27.67) mL/min, p = 0.03] and SB groups [13.46 (0.31–47.99) mL/min, p = 0.09]. In the present study, we compare hypertonic sodium lactate with two different therapeutic regimens; (1) a standard fluid therapy with isotonic crystalloids (0.9% NaCl, the most commonly used crystalloid). Although comparing hypertonic with isotonic formulations could appear misleading, it seemed necessary to have a control group corresponding to the usual clinical practice. (2) a non-conventional hypertonic fluid therapy. Due to an acidifying effect on pH and an elevated chloride concentration, hypertonic saline was not close enough to hypertonic sodium lactate. Conversely, sodium bicarbonate provided the same alkalizing effect and the same amount of sodium and osmoles than sodium lactate. Thereby, this comparison allows extracting clear conclusions and physiological assumptions. We report here that sodium lactate infusion improves DIC-associated renal microvascular thrombosis. The decrease in renal microvascular thrombosis in SL group could be at least partly explained by the delayed and attenuated procoagulant response (sodium lactate infusion resulted in a significant smaller decrease in platelets and fibrinogen concentrations and a significant smaller increase in plasma levels of TAT). It is known that glomerular thrombosis and vascular thrombosis due to the activation of inflammation and coagulation pathway contribute to the occurrence of acute renal failure in sepsis [5, 29]. Indeed, glomerular thrombosis and microvascular fibrin thrombosis compromise glomerular capillary flow, leading to focal ischaemia and necrosis, which is considered to be the main pathogenesis of LPS-induced acute renal failure [29, 30]. We first hypothesized that sodium lactate infusion may reduce the endothelial dysfunction and therefore restrict the coagulation cascade. In fact, it is known that endothelial dysfunction precedes derangement of platelet function or coagulation parameters and drives a pre-DIC-associated microvascular thrombosis in endotoxemia . In paediatric severe Dengue infection, hypertonic sodium lactate induced a partial recovery from endothelial dysfunction, as indicated by a significant decrease in sVCAM-1 . Moreover, lactate as a metabolizable anion may lead to chloride egress from endothelial cells, causing reduction in swelling and improvement in barrier function . In our model, we already observed that sodium lactate infusion seemed to reduce capillary leakage . In the same way, we observed a non-significant lesser haemoconcentration with lactate infusion in the present study. However, the evolution of von Willebrand factor, a marker of endothelial dysfunction, was not different between groups. Finally, further investigations focused on endothelial function are warranted to explore the sodium lactate impact on capillary leak. An other explanation of the beneficial effect of sodium lactate on DIC could be an anti-inflammatory effect. It is known that excessive inflammatory mediators play a central role in the development of endotoxin-induced DIC. TNFα plays an important part in the early activation of the haemostatic mechanism and in the pathogenesis of DIC . Indeed, a TNFα inhibitor can act as a protective drug in lipopolysaccharide-induced DIC in a dose-dependent manner . Then, it is known that plasma IL-6 is higher in patients with DIC than in those without DIC. Some data suggest that increases in IL-6 might give rise to hypercoagulable and hypofibrinolytic states. IL-6 could be a cause of DIC and be related to prognosis and organ failure . At last, immunoglobulin, in LPS-induced DIC model, could significantly decreased plasma levels of TNFα and IL-6 and improved haemostatic abnormality . Experimental studies of sepsis showed beneficial effects of hyperosmolar solutions modulating inflammatory response, as for instance the expression and release of cytokines TNFα and IL-6 [37–39]. The use of hypertonic saline solution has also demonstrated potential anti-inflammatory effects related to neutrophil activation . Hypertonic solution acts on polymorphonuclear A2 adenosine receptors and causes a feedback mechanism that stimulates cAMP and PKA release, thus blocking neutrophil activation [41, 42]. Nevertheless, the therapeutic window for a beneficial effect of fluid resuscitation with hypertonic fluid seemed to be very narrow  and may be related to leukocyte activation at the time of fluid use . Our study confirms the beneficial impact of hypertonic solutions on the IL-6 release but not on TNFα. These results could explain part of the beneficial impact of sodium lactate infusion compared to saline. However, it does not elucidate the difference on coagulation status between SL and SB groups. In this way, another explanation could be that lactate by itself has important other anti-inflammatory properties. Binding of lactate on a specific membrane receptor (the plasma membrane GPR81) recruits the intracellular adaptor molecule ARRB2 to the receptor with subsequent inhibition of the NLRP3 inflammasome leading to a reduction in the Il-1β-mediated proinflammatory response . Systemic LPS administration induced high levels of proinflammatory cytokines Il-1β, which contribute to the increased leukocyte–endothelium interaction and promote coagulation cascade . Pigs were chosen as a clinically relevant species, resembling to humans in coagulation reactions . Nevertheless, our model presents some limits. The length of evaluation is short, only 5 h. Bolus injection of endotoxin induces initial characteristics of human sepsis such as activation of innate immune system and rises in TNFα. Its short-term effects on the inflammatory cascade and the lack of an active nidus do not allow to study the compensatory anti-inflammatory phase often leading to immunosuppression. Nevertheless, endotoxin challenge is still a way to explore the very beginning of sepsis and the better resuscitation fluid strategy in this initial phase. Endotoxic model is not a model of hyperdynamic septic shock. Our model was a hypodynamic shock with a pronounced pulmonary vascular response. However, it reproduces some main alterations of inflammatory states, e.g. macrocirculatory and microcirculatory dysfunctions, coagulopathy, organs failure. We used the intravenous route for sepsis induction while patients are often infected by natural route. The temporal evolution of the aggression was imposed when the pathological process of patients following an individual natural progression. The endotoxin challenge is responsible for a more explosive proinflammatory response than in a septic shock. These limits, without questioning the validity of our pathophysiological model, could impair the comparability with DIC observed in human septic shock. In this study, we also reported that sodium lactate preserves GFR. This finding could be at least partly explained by the slightest renal microvascular thrombosis but also by the hemodynamics and microcirculation improvements previously described [25, 26]. Two limits must be reported; (1) GFR do not accurately assess kidney function. Moreover, there is a dependence between diuresis and CrCl calculation which might have participated to the improvement in CrCl. (2) The mean arterial target threshold of 65 mmHg was not reached for two animals in isotonic saline group and one animal in sodium bicarbonate group. This may have impacted negatively the renal perfusion pressure during the resuscitation phase independently from the type of fluid resuscitation. Nevertheless, low blood pressure (< 65 mmHg) occurred only at the end of the experiment, and we already found severe oligo-anuria in these animals before mean arterial pressure falls below 65 mmHg. In conclusion, sodium lactate improves DIC-associated renal microvascular thrombosis and preserves GFR in our model of endotoxic shock. In the same way as hemodynamics improvement previously observed, these findings could at least partly explain the preservation of fluid balance with sodium lactate. In our model, the beneficial effect of sodium lactate on DIC-associated renal microvascular thrombosis could be related to an anti-inflammatory effect (e.g. blockage of the NLRP3 inflammasome). Further investigations are warranted to explain the underlying mechanisms and to assess the potential clinical benefits of sodium lactate resuscitation in human sepsis. TD involved in conception and design, logistics, data acquisition and analysis, drafting of manuscript, manuscript writing and final approval of the manuscript. AD contributed to data acquisition, logistics and final approval of the manuscript, and AT contributed to data acquisition and final approval of the manuscript. VG involved in histology analysis and final approval of the manuscript and also in logistics and data analysis. FP, FT, SP, EB and EP-D involved in conception and design and final approval of the manuscript. MJ contributed to logistics and final approval of the manuscript. DM involved in conception and design, data analysis and final approval of the manuscript. JP contributed to conception and design, data analysis and final approval of the manuscript. RF involved in conception and design, data acquisition and analysis, drafting of manuscript, manuscript writing and final approval of the manuscript. All authors read and approved the final manuscript. We thank M.H. Gevaert and R.M. Siminski (Laboratory of Histology, UNIVERSITE de LILLE, F-59000 Lille, France) for the technical support. The data sets used and analysed during the current study available from the corresponding author on reasonable request.